Retail Price: $269.95 ONLY: $249.95! 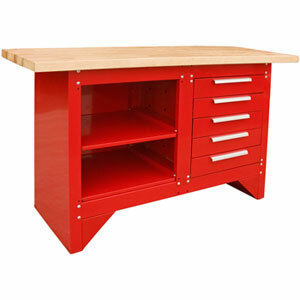 The TCWBW5 is a heavy duty, steel workbench with a heavy duty wooden top. This workbench is designed for general shop use and has a large surface area that makes it an excelent work area for any kind of shop or garage environment. 5 heavy duty steel drawers w/ smooth action ball bearing slides also provide convenient storage space. The table has a 54” x 20” steel top, and the table’s height is 35 inches. The TCWBW5 weight is shipped in 2 boxes, box #1 weighs 85 LBS, box #2 weighs 70 LBS. If you have any questions or would like more information on this equipment, PLEASE CALL US AT 1-888-736-5094!